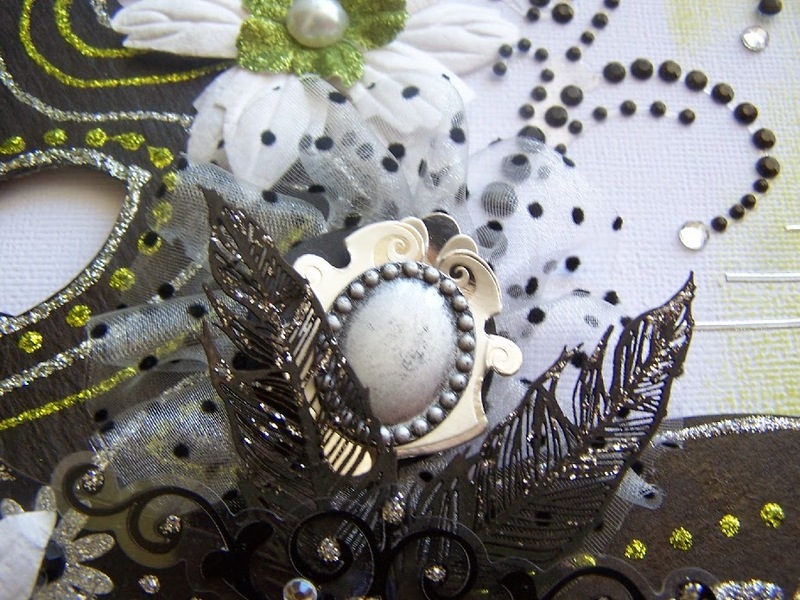 We have our two designers up today, Kathi and Mary to share with you their creations. First up is Kathi! Hi everyone, Kathi here, thanks for joining me! 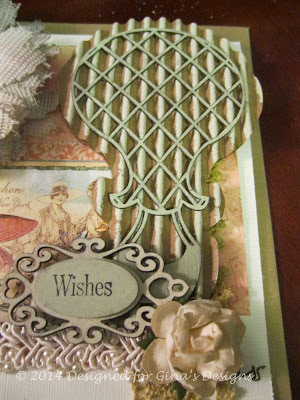 I have two cards to share today, in a design that's elegant yet easy to create. Now over to Mary who has something fun to share! You know what today is? Today marks five months til Christmas Eve! 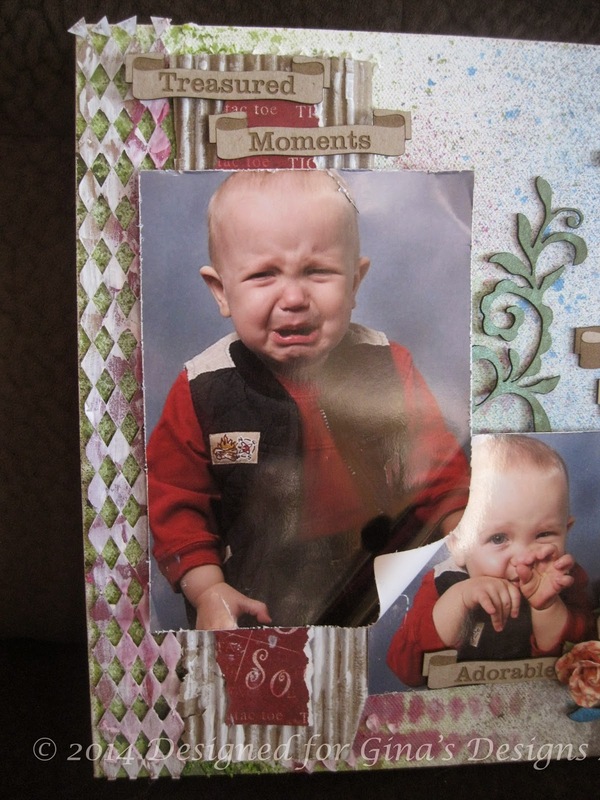 Just a friendly reminder to start on all the gifts you were going to make last year but ran out of time! Today I have another new item in Gina's store, the new "letter your life". With these you get to custom make your word! That's right, crafters. The large letter will be the first letter in the word you ask for. Just think of all of the possibilities! 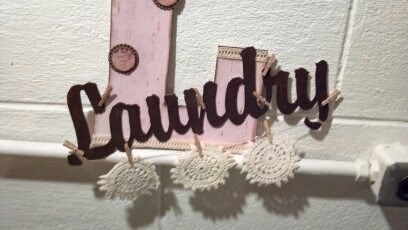 I guess I had laundry on my mind when I was asked to pick a word since that is what came out of my mouth. I wanted this to be fun yet simple since it will be hanging on the wall in the basement. 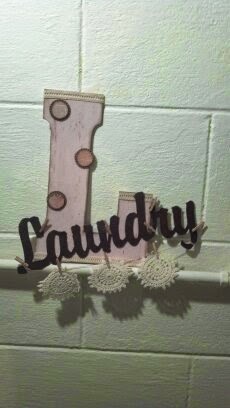 I covered the "L" with paper and embossed the word laundry. It will be mounted on the wall but I still need to paint it (my mom and I have only gotten the walls primed). I also used the new punchelements 1". These are stackable element sets that you are able to use your 1" punch with! Thanks for stopping by the blog today! Have a great one. Hi everyone! 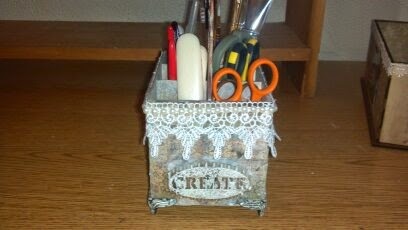 Melissa here with my take on our artist trading block. I painted my block with white gesso, then black acrylic, then a coat of glossy accents. I felt that the chipboard and doilies I put on the block perfectly complemented the theme, and era of the images. I painted all the chipboard with gesso, then turquoise Viva Color Precious Metal Effects. 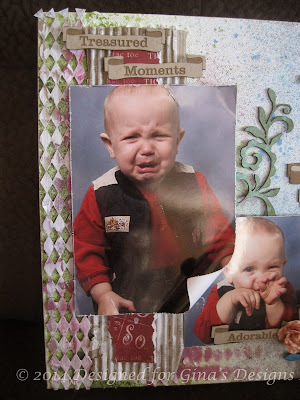 I didn't need gesso on the doilies,and I also painted them in turquoise. 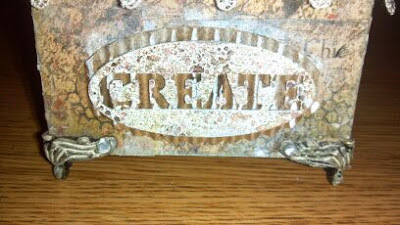 On some chipboard I added a little bronze paint, stickles, green Lumieres, and/or diamond glaze coating. I embellished my block with images, bling, metal, feathers, beads, moss, pearls, and lace. Thanks for looking! Hi Everyone! We have two amazing designers on the blog today sharing very different types of projects. First up is Shanna. Hi everyone. 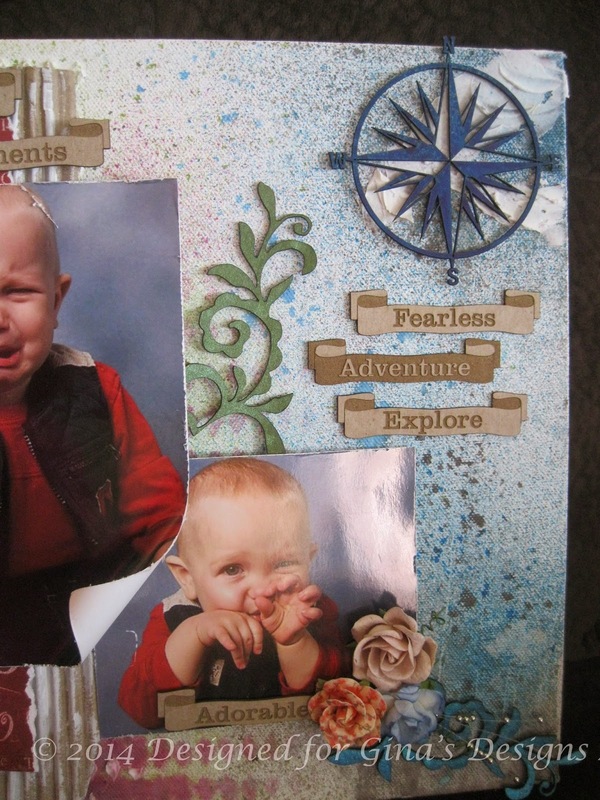 Shanna here today to share an ATC Shrine I decorated. I painted my shrine with red acrylic paint and distressed the surface a bit, then lined the inside with Graphic 45 papers. 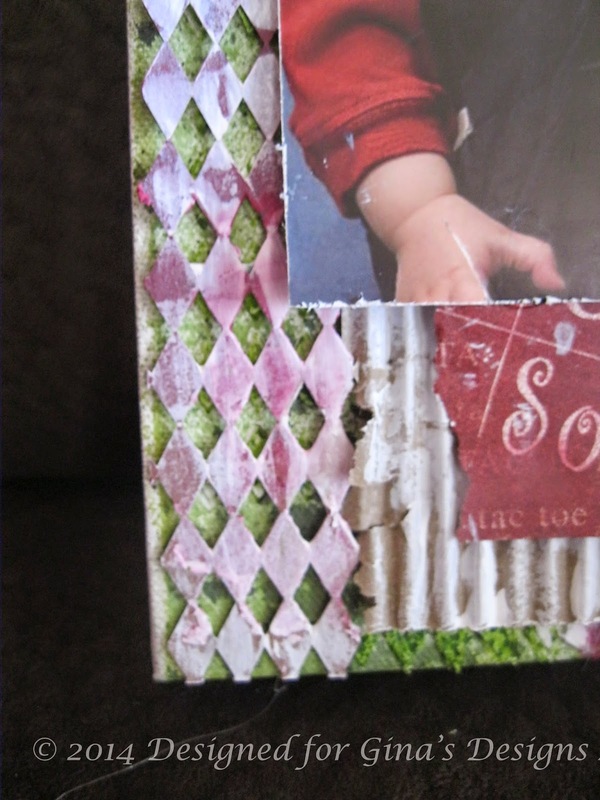 I fussy cut some of the images from the papers and placed sand underneath them! Next up today is Brigitte with a mixed media canvas. Hello crafty friends! I have a burlap canvas to share with you today featuring my daughter's first grade class photo, beautifully highlighted with Gina's laser cuts. I primed the canvas in spots with Gesso and sprayed the colors I chose as a base for the canvas and began applying all the pieces in my vision :) I primed all of the laser cuts with Gesso and used sprays and embossing powders until I got the desired results for each piece. And finally on the right side of the canvas I showcase the banner border which I cut to fit and the "Beautiful" phrase from the Words and Phrases 1 set. I am so happy with how this came out and would not have been able to make it happen without Gina's designs! you have already figured out, I plan on using this as a free standing item. 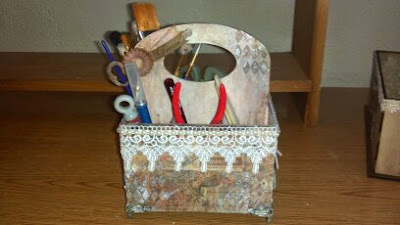 While it may be designed to hold your paint brushes, I wanted to give you some other ideas of what you could place in this great caddy. 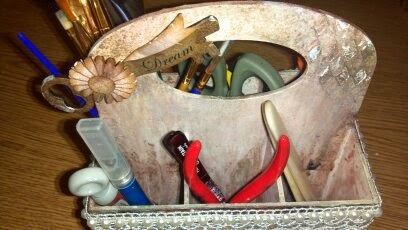 The compartments are deep enough to hold your smaller scissors or bone folders! This is one of the new Word Stackers in Gina's store. The other side of the box says inspire! The wooden key is an element piece that Gina created and sent to me in my DT box! Please visit my blog for the complete list! 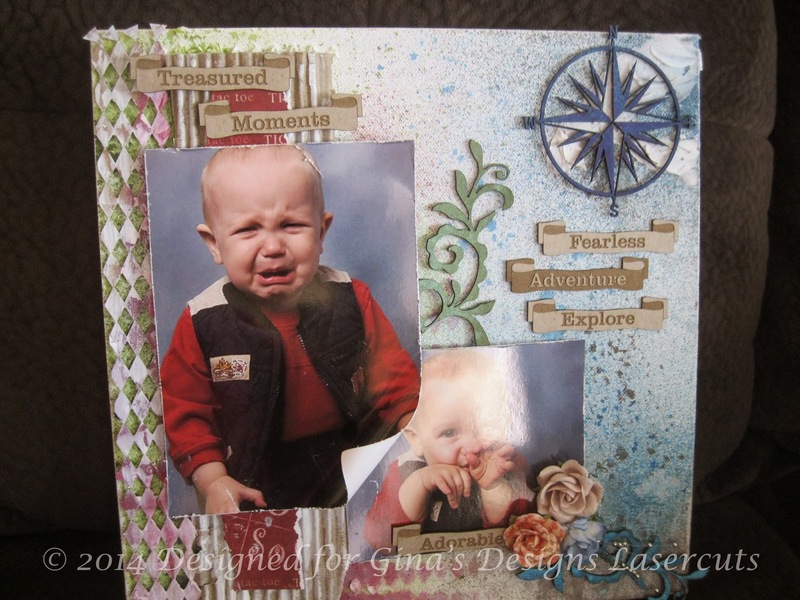 Hi, Kathi here to share my second project for July called "Treasured Moments". This canvas was based on the June Sketch Challenge. We have two designers up on the blog today. 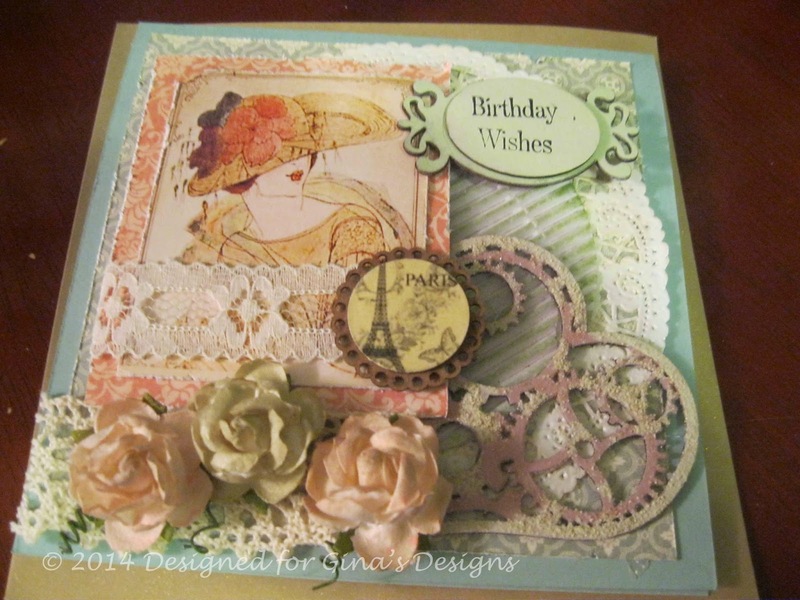 First up is Melissa with two beautiful botanical styled cards to share. Also on the blog today, we are happy to welcome back Rashida as a guest designer! Hi everyone! 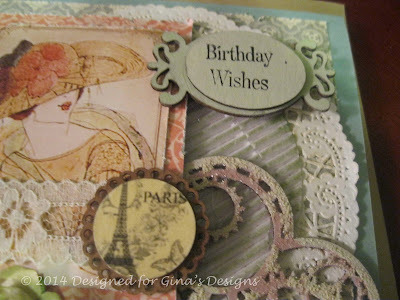 Melissa here with two cards using Gina's Lasercut Chipboard. I love these very elegant flourishes. I used them as tree branches in my design. I began by painting the flourishes with a coat of gesso. I then mixed green and brown watercolors, and dabbed on a little green chalk ink to paint them. I used a small paintbrush and water to take off a little paint from the centers. I put a bit of white paint on and them and blended it with the edges of the green. On the chipboard birds, I also began with a coat of gesso. I used birds from the Graphic 45 Botanical Tea papers as my color inspiration for the chipboard birds. I penciled in some lines to separate top from bottom, then I put a little of pink and brown on the the top. On the bottom I used a little blue, and a little green. On the heart I used gesso followed by pearl Viva Decor paste. 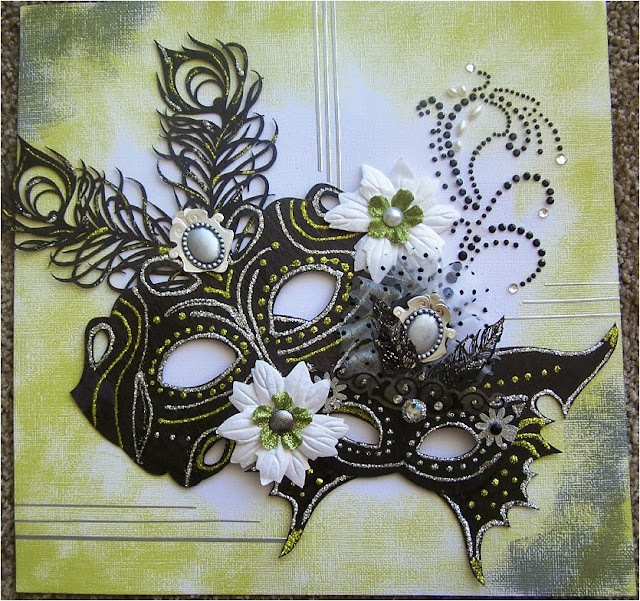 Next up is Rashida with a layout featuring our Masquerade Masks in two different styles. Hi Rashida here today! 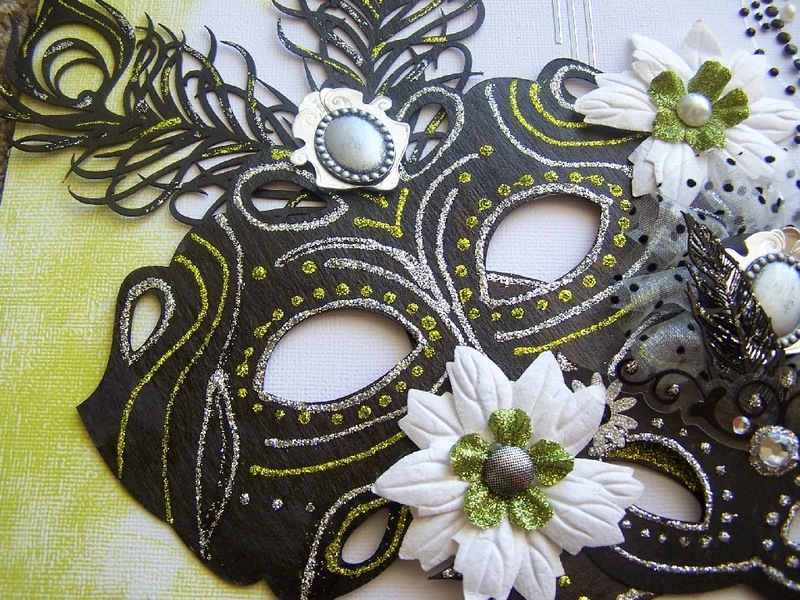 It's carnival time again in Washington, DC., and as a reminder of my Trinidadian heritage I made this wall hanging layout that I call "The Mask". All of the Caribbean islanders in the area come together and unite as one. Participants and visitors can enjoy dancing, celebrations, good food and fun. One thing that always captivates me is the bright display of colors that are seen so frequently in the islands. For this wall hanging I decided to use black for my mask base, because black represents unity and strength. Once I colored my mask with a black Sharpie paint marker, I highlighted the black mask with lime green and silver stickles to give it a little pop and sparkle. 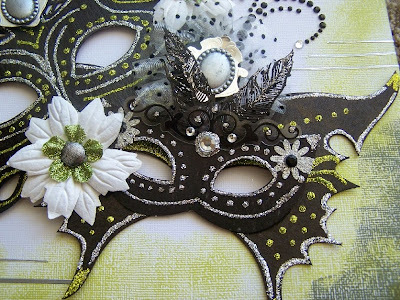 Finally, for the background, I added memento ink in lime green and gray to white textured cardstock. Once everything was dry I layered the mask on the page with pop dots and added a few flowers from my stash. For a finishing touch I added Dazzles silver strips and a few Jolees. First up today is Kim, with an awesome heritage styled altered frame. The Art Deco Borders & Corners were perfect to add to this frame to give it the heritage style that I was going for. 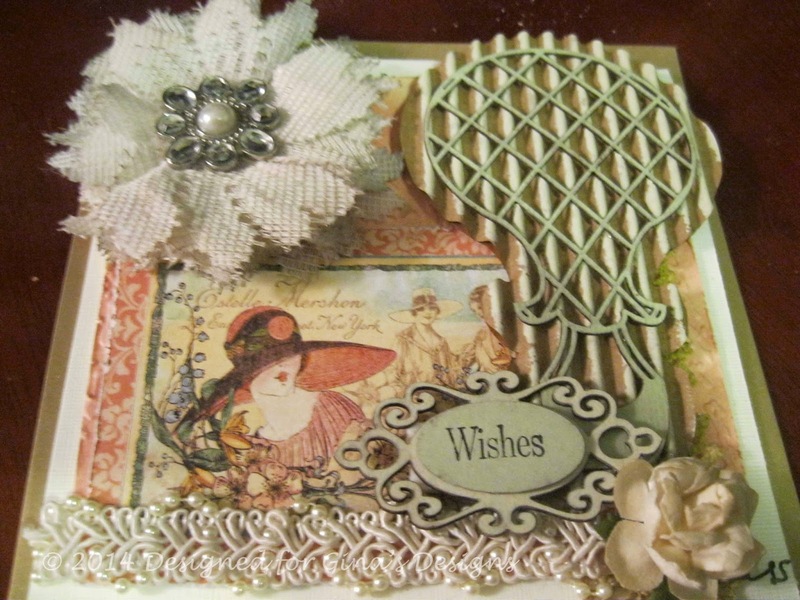 I embossed them with some Stampendous Shabby Ivory embossing powder. Below you can also see one of the wooden charms from Gina's Store that I have used. I thought that the word "memories" was apropos. Below I have used the antique bike, and keeping in the color theme embossed it with more of the shabby white embossing powder, with just a touch of some gold to make it stand out. Thanks so much for stopping by today! I hope you will check out these goodies in Gina's Store. Next up is Donna, one of our new DT members! Hi everyone, I'm Donna, and this is my first project for Gina's Designs! I am so grateful for this opportunity to create beautiful things! I am really impressed with the quality of her products, and all the beautiful shapes, home decor and storage items. Now on to my first project. Is everyone excited about the upcoming fireworks? We live next to a high school that puts on an amazing fireworks show each 4th of July, so we are looking forward to that again tomorrow night! We just sit in the front yard...everyone is invited! Bring a lawn chair! I love items that frame a photo. I used the chain and gears frames for both photos. I simply cut off the gears for this layout. I painted the frames with gesso, and used fired brick crackle paint. Not so much for the crackle, but because of the color/texture. I dabbed some red ink to brighten up the color. I did the same thing on the two stackable labels under the bow. I debated about leaving the chipboard natural. 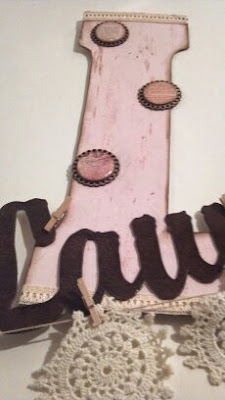 I love that look and I think it would have worked well with the burlap and the bow. Thank you so much for taking a look! Have a fun, safe July 4th weekend! Hello Again Everyone! 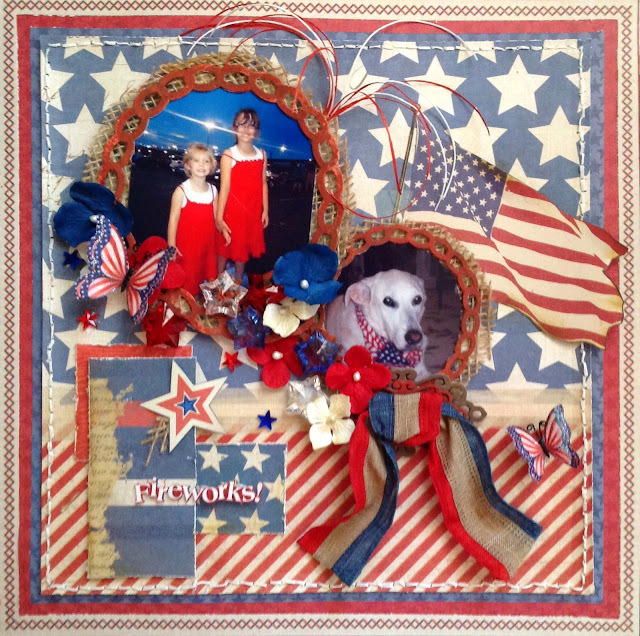 Veronica here to Celebrate our Independence Day with Gina Designs! Today's project is three Artist Trading Blocks stacked on top of one another to create a fun 4th of July center piece! The 4th of July has always meant a lot to my family, because my Dad fought in the Vietnam war. So every year I find myself creating a fun decorative center piece for the 4th of July Barbeque. These Artist Trading Block are perfect to make a lovely holiday display!